Panettones are a Christmas classic. Enjoy this delicious treat in miniature version with our easy to follow recipe, below. Making traditional Christmas recipes can involve a lot of different flavour and spices and more importantly, you want good quality. It makes such a huge difference. That’s why I very strongly recommend Steenbergs organic spice and herb gift set. It has all the spices and herbs you need for excellent holiday cooking and baking including ground cinnamon, nutmeg, ginger, sea salt and several more and it is entirely organic. Makes a great gift or perfect to keep for yourself too! Gently warm your milk in a saucepan and dissolve your caster sugar in it. Set aside to cool. In a large mixing bowl, mix together your flour, yeast, cinnamon, sea salt, and ginger. Work the softened butter, sultanas and orange peel into your dough with your hands. It should become quite sticky. Make sure the fruit gets spread evenly. Divide the mixture into 8-10 equal balls and place in muffin cases on a baking sheet or in a muffin tray. Cover with cling film and leave to rise for about 45-50 minutes. 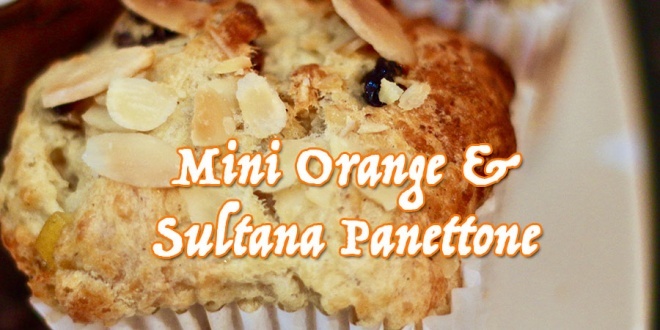 Uncover your mini panettones and brush with milk, and press a few flaked almonds into the top of each of them. Bake on the middle shelf for 20-25 minutes until fully risen and golden brown.